These videos were selected and digitised from a small collection of motion picture films held in the collection of Wellington City Archives. They were used to document council activities in what was regarded as being a modern (albeit very expensive) media. All were of an ephemeral nature and were made to be shown soon after being made to small select audiences drawn from the public and Council staff. Most were likely to have been screened in the small theatrette which was in the former Central Public Library (today the City Art Gallery). Wellington City Libraries wishes to thank the Wellington City Archives for the loan of the films and for allowing their digitisation. 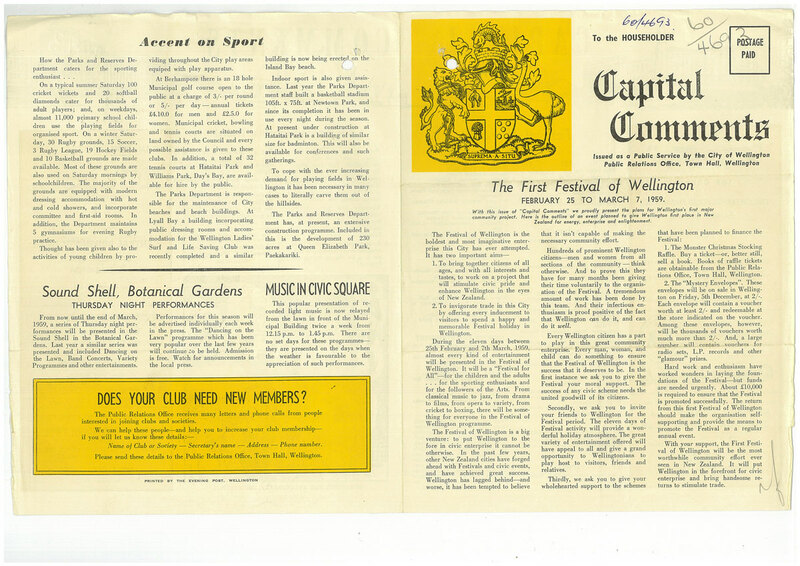 Though the city had previously held small-scale music festivals, the 1959 Festival of Wellington was the first time a festival was that covered a wide range of music, arts, drama and sports events. It opened on Wednesday 25 February 1959 with a lunchtime parade which travelled the length of the Golden Mile. 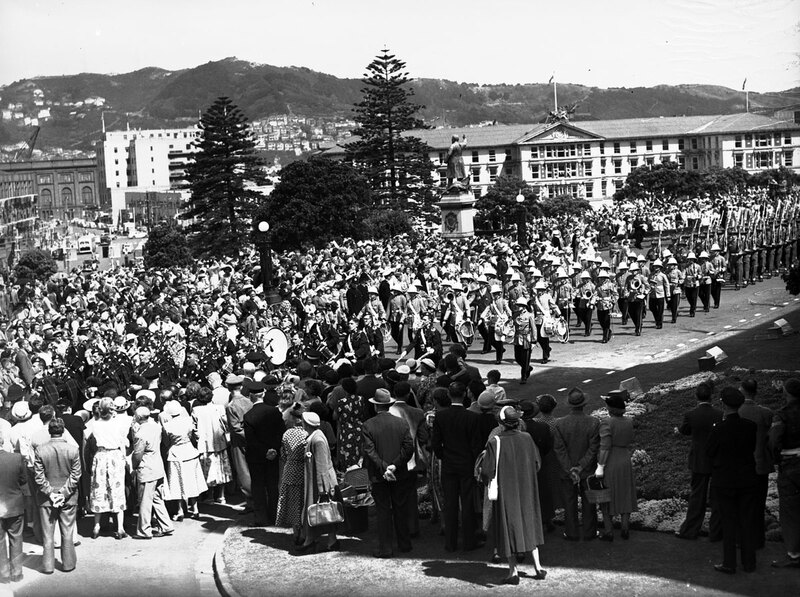 A huge crowd believed to be up to 100,000 people from across the region lined the streets to watch the festivities (at the time, Wellington City's population was only 120,000). Over the next 10 days the city revelled in a huge variety of cultural and sporting events such as a visit from the Harlem Globetrotters basketball team, light opera, ballet, performances from the Alex Linsday Orchestra and marching displays. 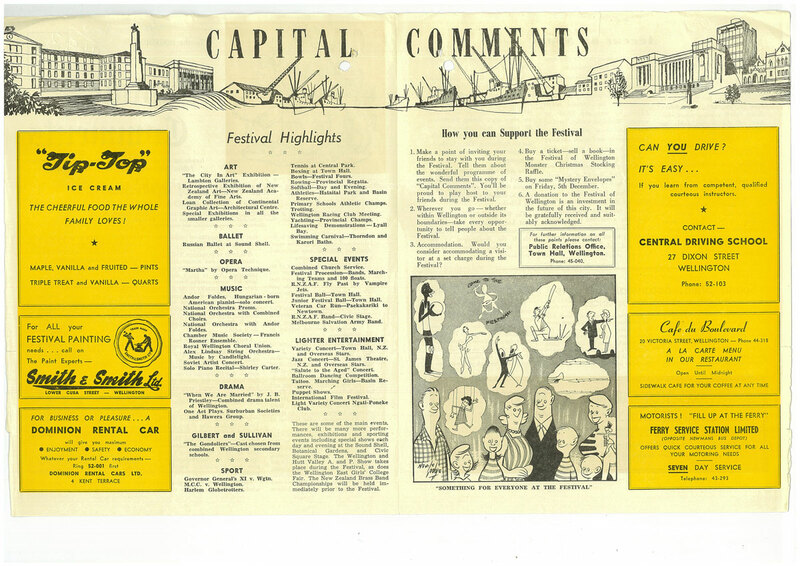 There were also exhibition cricket matches at the Basin Reserve, jazz shows, cabarets, and performances from a variety of groups on a temporary stage built in front of the Central Library (today the City Art Gallery in Civic Square). The City Council asked a group of local amateur film enthusiasts, the Wellington Cine Club, to capture the festivities on 16mm colour transparency film. Knowing that the high cost of the film stock and its processing would be covered by the Council, members of the club readily agreed to the proposal. The different sections were then spliced together and a magnetic soundtrack was laid over the top of the edited film (most films of the era had optical soundtracks as this made it easier for multiple copies to be made). Unfortunately the magnetic soundtrack has degraded over time but the commentary is still understandable. Because of the nature of the soundtrack and because colour transparency (rather than negative) film was used, it is likely that the original reel is unique and no further copies were ever produced. 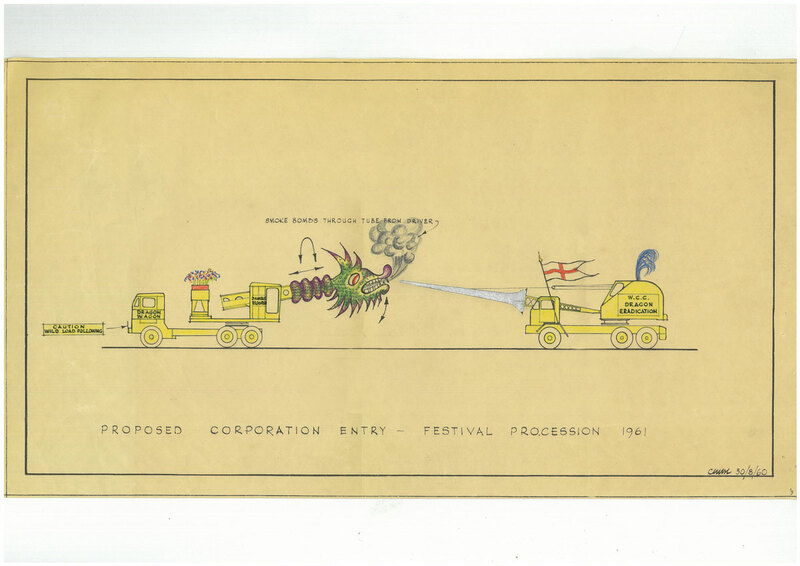 The success of the 1959 festival resulted in a similar event in 1961 but the planned 1963 festival was cancelled due to a clash with the royal visit of Queen Elizabeth II and the Duke of Edinburgh and another festival was not to be held until 1973. 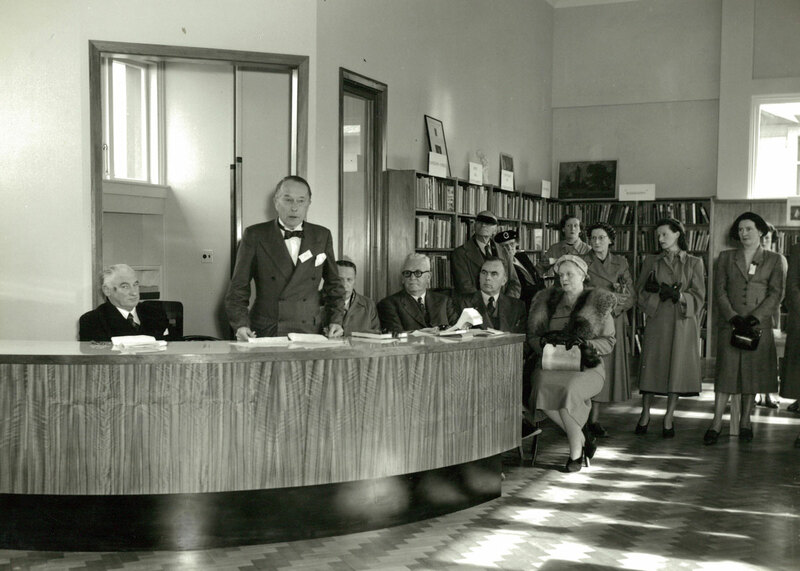 The Khandallah Branch Library opened in 1953 after more than three decades of lobbying by local residents. 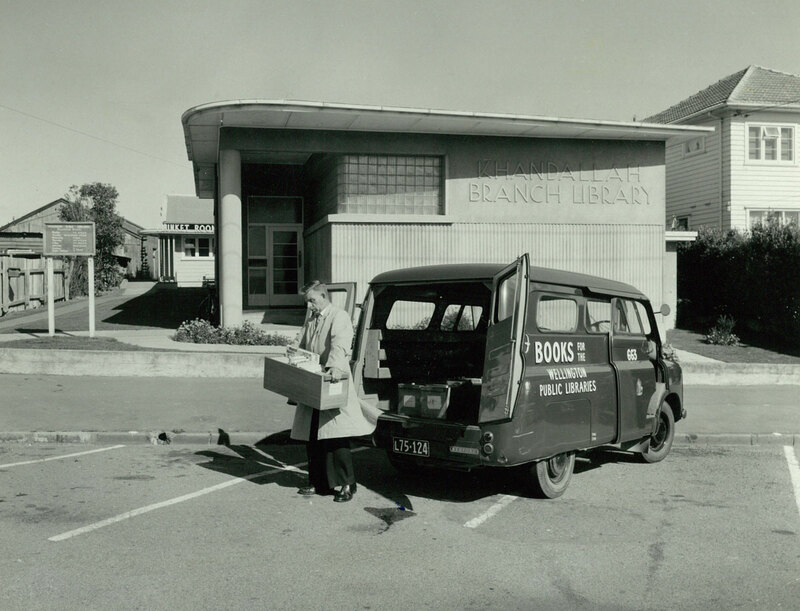 The proposition that the suburb should have its own library first emerged shortly after the Onslow Borough (of which Khandallah was a part) amalgamated with Wellington City in 1919. Various ideas for creating a library were suggested to the City Council over the years. Sections & houses were offered to the WCC to purchase for conversion, a former-military "nissen" hut was suggested as a temporary measure, and converting part of the Khandallah Town Hall was considered and rejected. In 1943 the educator and local historian Fanny Irvine-Smith began collecting signatures for a petition to pressure the City Council to finally build a permanent public branch library. It was eventually signed by 1292 residents and became the catalyst for the Council to purchase the house and section at 8 Ganges Road for £1400. However the shortage and high cost of building material and labour in the immediate post-war period delayed the construction of a purpose-built library so in 1947 the house at the back of the section was internally divided into two. One half became a temporary library and the other the local Plunket rooms. Finally in 1951, tenders were called for the construction of a new library with the contract eventually given to the local firm of L. E Borrell Ltd who offered to build the facility for £7139. 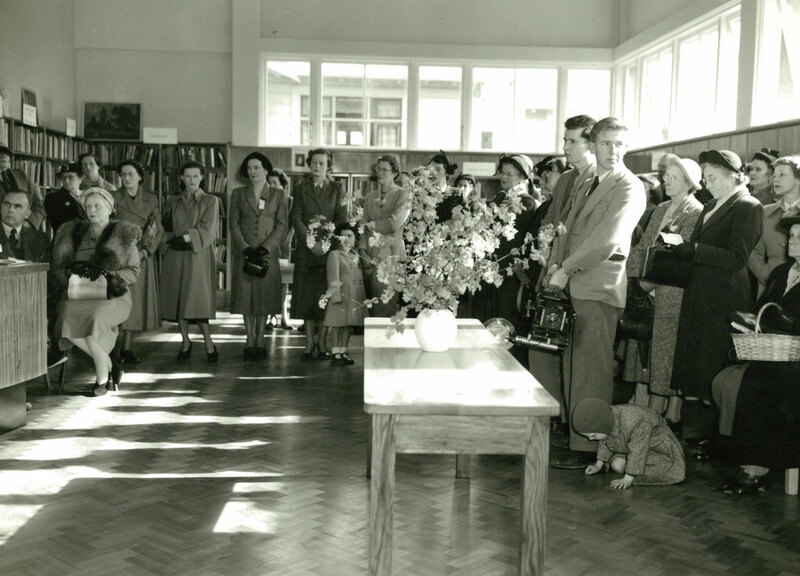 Construction of the library began in 1952 and it officially opened on Wednesday 27th August 1953 at 2.30pm. The house at the rear of the section was fully re-configured as Plunket rooms and the two facilities have operated side-by-side ever since. This film briefly captures a slice of mid-century life in suburban Wellington with both old and young turning out in their best clothes for the grand occasion. It was filmed using several different speeds on the same reel and though these were normalised when the film was digitised, this has resulted in a low frame-rate at the beginning. Identified exiting the library at the 35-second mark is John Sage. 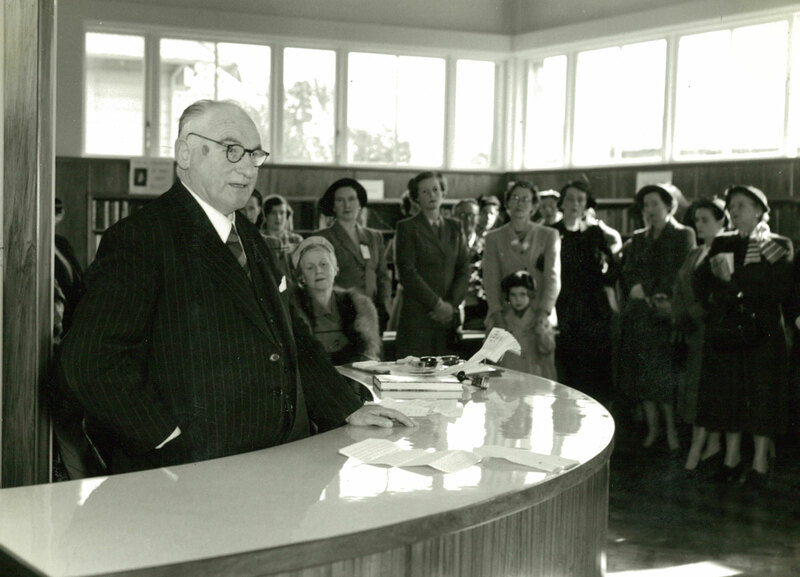 He later went on to become the Deputy Librarian for Wellington Public Libraries and then Head Librarian at the Victoria University Library. He passed away in 2005 at the age of 84. Please let us know if you can identify anyone else in the film. The visit of Queen Elizabeth II and the Duke of Edinburgh from 23 December 1953 to 30 January 1954 was the first and longest visit of a reigning monarch to New Zealand. It was a remarkable event where people lined streets in numbers which have never been equalled; grown men wept, conservatively dressed women ran like teenagers and children fainted from heat exhaustion after waiting in line for hours. It's estimated that during that five week period, three out of every four New Zealanders saw the Queen at least once. The royal couple's first visit to Wellington was planned to begin on Saturday 9 January 1954, but the Duke of Edinburgh made an unexpected flying-visit to the Capital ten days earlier to attend the internment at Karori Cemetery of unidentified victims of the tragic Tangiwai rail disaster. 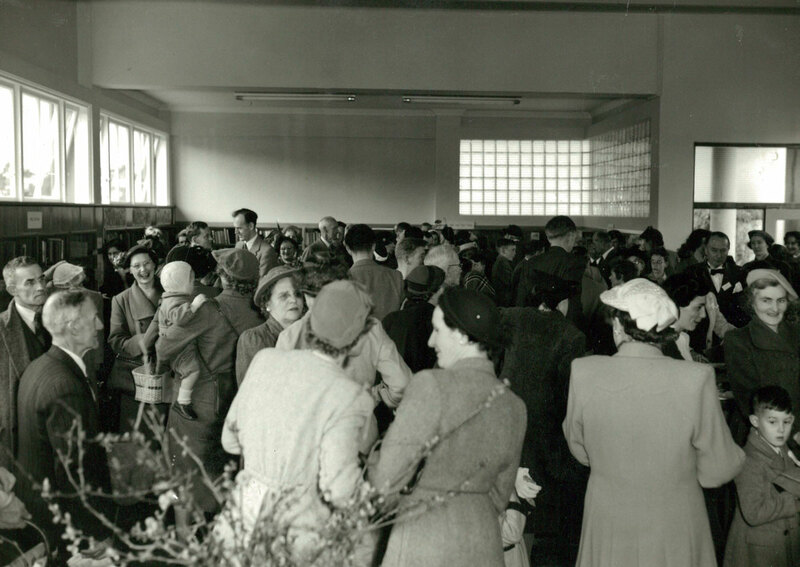 When the Queen finally arrived via Paraparaumu Airport (Wellington Airport was not to open until 1959), the city was to be in an ecstatic buzz for the next six days. This silent film made by a WCC staff member captures the atmosphere, fashion and cityscape of Wellington in the early 1950s. The first five minutes shows the preparations for the visit and the extraordinary lengths people went to decorate the city. Decorative hoardings can be seen up against the Council's main Municipal Office Building which was being constructed at the time. This is followed with crowds gathering outside Parliament on Monday 11 January awaiting the arrival of the Queen dressed in her spectacular Coronation gown for a parliamentary reception. After a sequence showing some of the special lighting which was installed in Oriental Bay and around the Town Hall, the film moves to the following day where the Queen returned to parliament to open a special sitting of the House of Representatives. The next sequence is on the afternoon of Wednesday 13 January and was filmed outside Government House as invited guests arrive to attend a garden party. After more footage of bunting, flags and decorations around the city, the film ends at Wellington Railway Station on the morning of Friday 15 January as the couple board the royal train to Masterton. They returned by car that evening before leaving Wellington to begin the South Island leg of the tour the following day. Produced by the Government Film Studios in collaboration with the Wellington City Council, 1947. In 1918 the Wellington City Council established a Municipal Milk Department, possibly the first local authority in the world to do so. It was set up in response to concerns over the quality of milk being supplied to Wellington citizens. The Council had previously tried to gain some control over quality with the passing of the Wellington City Council Milk Act (1906), but it was the impetus of the councillor (later to become Mayor), Sir Charles Norwood and his concern for the health local citizens that led to the establishment of the department. Initially the Council just concerned itself with the collection and treatment of milk at a depot which it established in Dixon Street but in 1922 the Department took over complete control of supply from farm gate to consumer and introduced bottles. 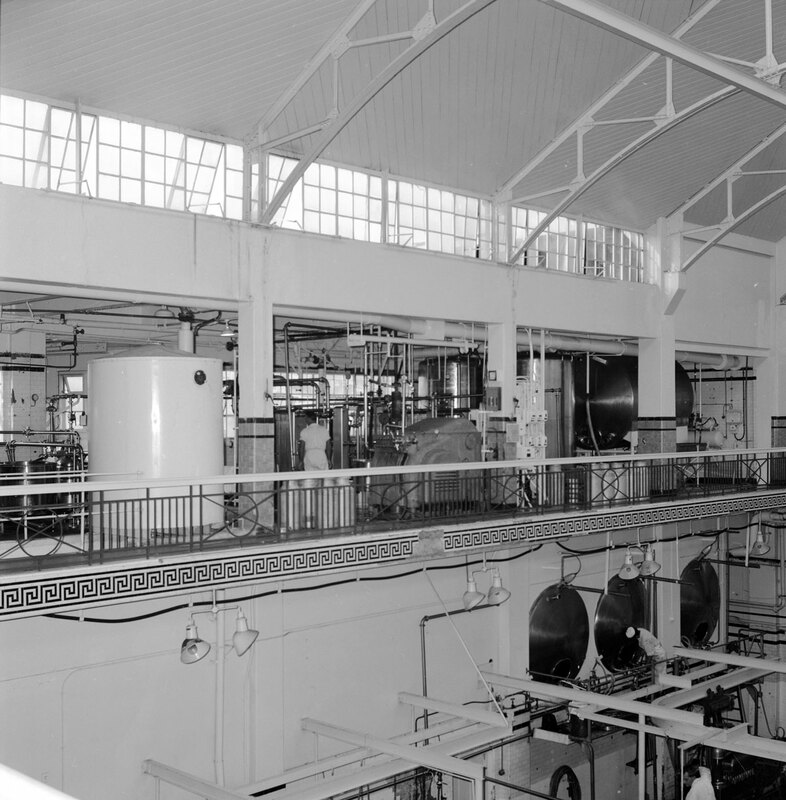 This move led to the purchase of the Council's first dairy factory at Otaki and soon the Department became the sole supplier and distributor of milk to homes and schools from Wellington to Levin. 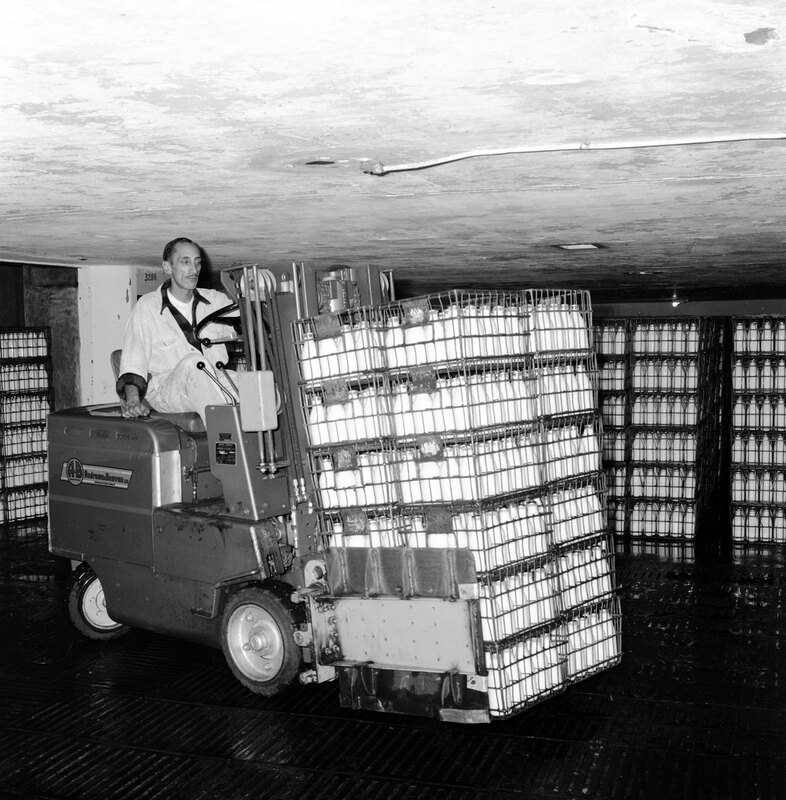 Dairies had to be licensed and were subject to Council hygiene inspections and random milk testing as it was then illegal for agents to sell (or even to be in possession of) low-fat milk. Prosecutions of dairies caught selling low-fat milk were not uncommon as this generally indicated that the dairy owner had watered-down the product to increase their profit margin. It soon became apparent that the department's premises in Dixon Street were woefully inadequate so in 1931 the Tory Street Milk Depot was designed and constructed at a cost of £150,000. In 1947 the depot featured in this short film produced by the Government Film Unit (later renamed the National Film Unit) working in collaboration with the Wellington City Council. Today the site covers 129 — 139 Tory Street where a number of "big box" retail chains have their Wellington outlets. 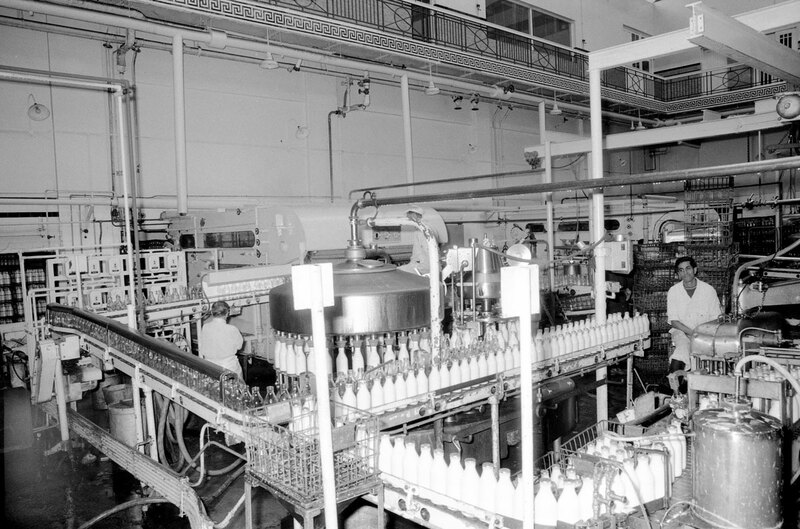 The Milk Department continued to operate as a branch of the City Council until 1987 when its status changed from a council department to a trading company known as Capital Dairy Products Ltd (CDP). CDP continued to operate until the Council agreed to sell its shares in the company to Tui Milk Products in February 1991 which later became part of Fonterra. The images below have been sourced from Wellington City Libraries collections. Click for a larger version. This page is written and maintained by our Local History Librarian, Gabor Toth. We'd be pleased to hear from you about this page - you can email us with any feedback.